This spicy and delicious walleye pollock roe comes in a time-saving tube. Once defrosted, can be used as-is. Each tube is 100g and arrives frozen. 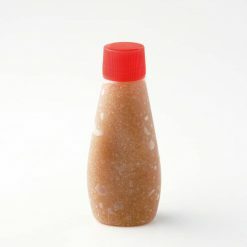 This spicy walleye pollock roe (called “mentaiko” in Japanese) has been skinned and packed in a tube, helping it to keep well and making it easy to use. This roe is strongly spiced, allowing its flavors to shine through even when used only as a component of a larger dish. How to defrost: Remove from bag and place beneath running water to defrost. 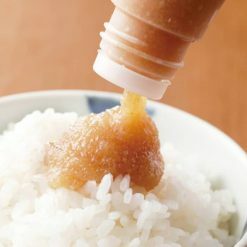 Alternatively, defrost in the refrigerator for 2 to 3 hours.How to eat: Once defrosted, the walleye roe can be used as a topping on rice, bread, pizza, or sushi; or cooked with pasta as part of a sauce.Note: This product does not contain any additives to make it keep longer, so after defrosting it should be stored it in the refrigerator and used within 7 days. This product contains walleye pollock ovaries (Russia or America), table salt, sugar, yeast extract, chili pepper, flavor (kombu seaweed, katsuobushi), thickener (guar gum, xanthan gum, pullulan).. Origin of ingredients: walleye pollock eggs (Russia, USA). Prepared and packaged in Japan.